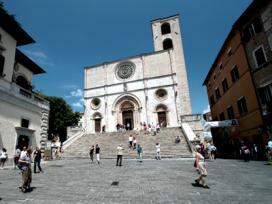 Beside the legends about the origins of Todi, the town was founded by the Umbrian people on 2700 before Christ. Later on, before the etrurians and after the romans held the power of the town, and building up a number of monuments, most of which can still be admired, like the Nicchioni Romani, on Mercato Vecchio square, which at the beginning were probably part of a basilica. On 88 b.C. Marco Crasso took for himself all the wealth of the town, and during the fall of the roman empire the town was robbed and destroyed. During this time bishop Fortunato bacame the protecting Saint of the town. During the Middle Ages, Todi was always in fight against the close Orvieto. On the XII century it bacame free commun, being this the onset of a very positve period, and marvelous monuments like Capitain Palace, il Priori Palace, the Dome and the very remarkable St. Fortunato Church were built. On 1236 Jacopone da Todi was born here, one of the firts poets to write in italian dialect and not in latin. On 1500, after a long dark period, the town rised again under the Renaissance influence; dated during this time has to be found the marvelous Consolazione Temple. Many of the public buildings rised during this time are due to the bishop Angelo Cesi.